First up tonight was German band Kissin’ Dynamite. Despite forming 10 years ago this is actually their first ever UK show. They arent particularly well known in the UK yet but based on tonight’s performance I think they will soon be a lot better known especially as they’ll be back in the UK in January for more dates with Amaranthe and Powerwolf. The venue was already busy by the time they went on stage, and the crowd certainly responded well to a great performance from Kissin’ Dynamite – it’s rare to see an opening act get such a good reception, and it’s safe to say they made a load of new fans tonight. Kissin’ Dynamite may not have played the Uk before but they’ve toured a lot over the years and that experience showed in their performance – this was a great high energy performance and they used every bit of space on the stage that was available. A band well worth checking out. Next up was Amaranthe. After a performance at Bloodstock marred by technical problems, the band were out to deliver a full show to the UK fans. They’re a band that put in high energy performances on stage to match the energy in their music – they’re constantly moving around the stage and headbanging or windmilling. The heat soon meant that singer Elize Ryd ditched her long leather coat to reveal an eye-catching red latex outfit underneath. The three vocalist arrangement that Amaranthe have means that there’s constant changes in who is the centre of attention at any given time and they all move around to give each other space and time at the front and centre of the stage. The set tonight really does span their career with songs from their 2011 debut album right through to songs from the current album. It really is an impressive performance from start to finish – high energy and highly enjoyable. Finally came Powerwolf. They’ve got a nice stage set on this tour and once the covers are removed ready for the start of their set it’s clear they have a lot more space to use than the first two bands. With the keyboard and drums on platforms at the back and a staircase there too there’s plenty of scope for the band to move around. They are a very theatrical band and it’s good to see them headlining venues in the UK where they get a big enough stage to have their full stage set. It’s only a few years ago that they were playing the Underworld or Islington academy, so they’ve built up their fan base signicantly in the last five years. 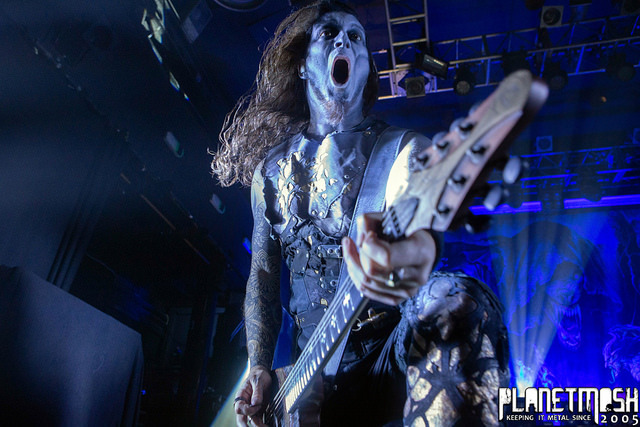 It’s a fantastic performance – the power metal element in the music lends itself well to a big over the top type of show and Powerwolf certainly deliver. The band are in great form and are constantly on the move as they play. It’s a great setlist too with six songs from their latest album mixed in with fan favourites from earlier albums. It’s testament to the quality of the new album that those songs go down just as well as their most popular songs. A fantastic set to end the night. Tonight really was a fantastic bill – Kissin’ Dynamite made a great impression on the UK fans then Amaranthe and Powerwolf both put in superb performances. All three bands are likely to go from strength to strength and build their uk fan base significantly over the next few years.